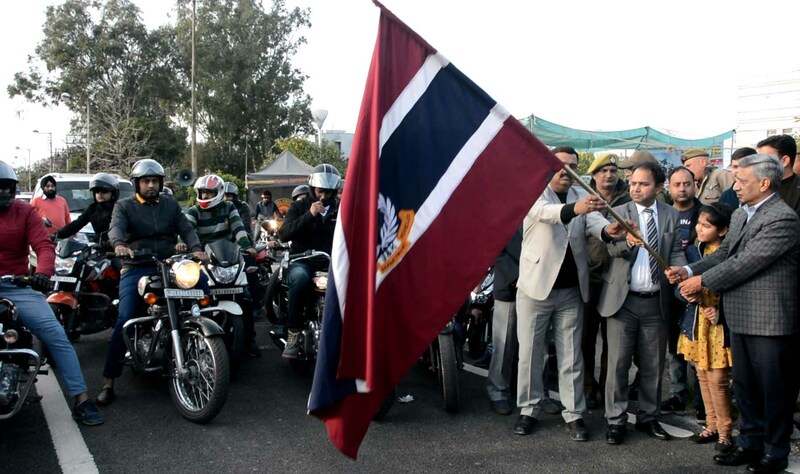 JAMMU, FEBRUARY 09: In connection with the 30th Road Safety Week, Transport Commissioner, SP Vaid flagged off bikers rally Saturday evening. The rally was organized by the Motor Vehicle Department in association with Directorate of Sports and Physical Education, University of Jammu. The rally comprised of 120 bikers started from Jammu University which will go through various parts of Jammu city and adjoining areas to educate the people about rules and regulations of traffic movement and will culminate at Jammu University. Vaid lauded the role of youth and hope that their efforts will become fruitful in educating masses regarding the traffic norms so that precious lives could be saved from day to day fatal accidents. Vaid also stressed the two and four wheeler riders to wear helmets and seat belts while driving their vehicles. Regional Transport Officer, D R Knethia, Assistant Transport Commissioner, Swarn Singh, ARTOs other officers and officials of the Department were present on the occasion.